Just 24 hours on from Kew Gardens winning the English St Leger at Doncaster, jockey Ryan Moore employed different tactics aboard Flag Of Honour, who was sent off the 2-1 favourite in the six-runner field. His opponents did include the Irish Derby winner Latrobe, though, and the two had it between them from some way out. Having won the Curragh Cup and the Leger Trial on his last two starts, showing a liking for this course and distance, Moore knew there were no stamina doubts and kicked on some way from home. Latrobe kept him honest inside the final two furlongs, but his petrol tank began to ebb inside the final 100 yards and Flag Of Honour took his record to five wins from 10 starts in winning by two and three-quarter lengths. 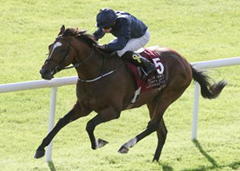 O’Brien said: “He’s a tough, hardy horse who handles an ease in the ground and he stays very well. “He has enough class for a mile and a half, but he gets this extended trip well. He’s progressing all the time and is really going the right way and Ryan felt he quickened well. “The way he picked up there you wouldn’t say that he’d have to step to extreme trips. He’s after having a busy time so we’ll have to see whether he runs again this year. O’Brien added: “This was always the plan. With Kew Gardens, the better the ground the better he’d like it. This horse will handle an ease and even if it got soft it wouldn’t bother him. “When Order Of St George went off to stud this horse was always going to come here to split them up. “I asked Ryan about Kew Gardens yesterday and he thought he doesn’t have to go Cup trips and this horse is probably the same. “When you go beyond two miles you’re never sure what’s going to happen. This horse looks like he could get up to it, but whether he gets beyond it and further – he mightn’t need to. Moore said: “He’s a very good horse, he’s grown up an awful lot and is taking his racing very well. “He’s got a fantastic attitude and it was very comfortable the whole way.